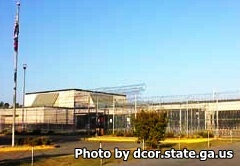 Baldwin State Prison is located in Hardwick Georgia. It is a medium security institution that houses adult males. Currently this facility can incarcerate approximately 925 offenders. General population is housed in seven different housing units that are either open dormitory, tiered, single cell or two inmates per cell. In addition to the general population, Baldwin State Prison has units for segregated inmates and an inmate infirmary. This facility is also responsible for evaluating and sometimes treating inmates who suffer from mental health disorders for 6 other regional institutions and often acts as a transportation hub where inmates can stay temporarily/await transport to a long distance facility. Like most correctional facilities, Baldwin State Prison offers inmates education including the ability to earn a GED, basic adult education (known as ABE) and special education courses. Vocational courses at this facility include horticulture, fork lift operator, barber, graphic art and design, as well as culinary preparation skills. Visiting is on Saturdays, Sundays and Holidays from 9am-3pm for approved visitors only.